Change management is the term for the steps an organisation takes to make sure the people affected by the change are able to adapt, and be successful in the new way of working. It’s a huge topic and something that is critical to making changes stick. And it’s something that large organisations spend a lot of time and money on. The trick is not to overdo it and spend more time and money that you need to. That’s where we come in. A particularly astute business owner decides to start using a visual management system to help with planning and keeping track of work done by his team. This involves a new task management tool, and a new process for organising and assigning the work. For the team, it means a fairly significant change to how their work is organised, and a new online app to get to grips with. With no change management, the situation could turn difficult, as people get confused, can’t work out how to use the app, and don’t understand what’s expected of them. This leads to an unacceptable drop in productivity, and in the worst case a ‘backslide’, when people find things too hard to cope with and go back to the old way of doing things. But with our approach, we help you make sure your people are ready, willing and able to take advantage of the new way of working and perform even better than before. We do this through a streamlined version of the ADKAR model devised by Prosci change management organisation. 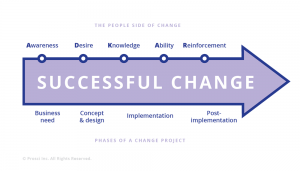 It says that for change to be successful, the people involved need to move through all of the following five stages, in this order. The last very important point is that none of this will work without strong sponsorship from the leaders of the business. As outsider advisors we don’t expect to hold sway with the staff, so the change has to be led and fronted by you. It’s not a huge job, but it could be the most important thing you do to make your improvement a success.